Zero-gravity battles! Lightsaber duels! Dead Greedos! It can only mean one thing: Star Wars: The Clone Wars is back for a second season and, yes, it actually is better than ever. 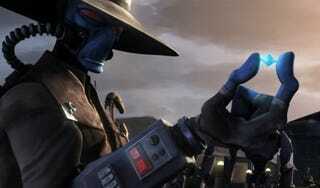 Last night's double-length premiere, "Holocron Heist/Cargo of Doom," brought Cad Bane further to the forefront of the series after his appearance at the end of last season, but what made the episodes work weren't so much that character - He's still pretty much a cypher who's just a little bit less inept and more successful than last season's villains; given that he's working for Darth Sidious, he's essentially just another Seperatist flunkie, as opposed to part of a theoretical third Bounty Hunter faction as was teased previously - as much as the show finally finding balance between comedic side characters, action and character development. We got to see Anakin's emotions overpowering his mission (Hi, Revenge of The Sith foreshadowing!) when he gave in to Bane to save the life of Ahsoka, as well as Ahsoka learning the wrong lessons from Anakin's tutelage at the opening of the episode (Winning isn't everything, unless your name is Skywalker, it seems), but this was nicely balanced with some of the best action sequences the series has come up with - and so many of them! Battles in space, zero-gravity battles aboard spacecraft (with some wonderful choreography from the animators), lightsaber duels, and large-scale ground battles were all on offer, bringing a sense of large scale... well, war, to the series that we hadn't really seen since the show's earliest days. In addition to all of this, the start of what looks to be a subplot running all through the season - Darth Sidious looking for all the future Jedi by stealing a database of all known "force sensitive" children in the universe. After a first season that seemed fragmented and scattered a lot of the time, bringing a throughline to this second season (and one that makes sense in the larger Star Wars context) is very welcome, giving the show a necessary continuity and unique story to tell that it's missed up until this point. Not to mention, Bane's supposed death (Because, sure, there's no way he's that clone trooper who's wandering around with the sore arm at the end of the episode, nooooooo) being a fun, if obvious, swerve so early on, if one betrayed by publicity for the season featuring him so prominently. All in all, the return of Clone Wars was a surprise joy: It was more confident than before, and deservedly so - everyone involved had raised their game, and gave us the most "Star Wars-y" Star Wars we've seen in years... even moreso than the movies this series is based on. Let's see if they can keep it up all season.